Pennsylvania’s Department of Agriculture says it has submitted an industrial hemp plan to the USDA and will re-open its 2019 program to allow more participants. The trigger for all this is the 2018 Farm Bill. 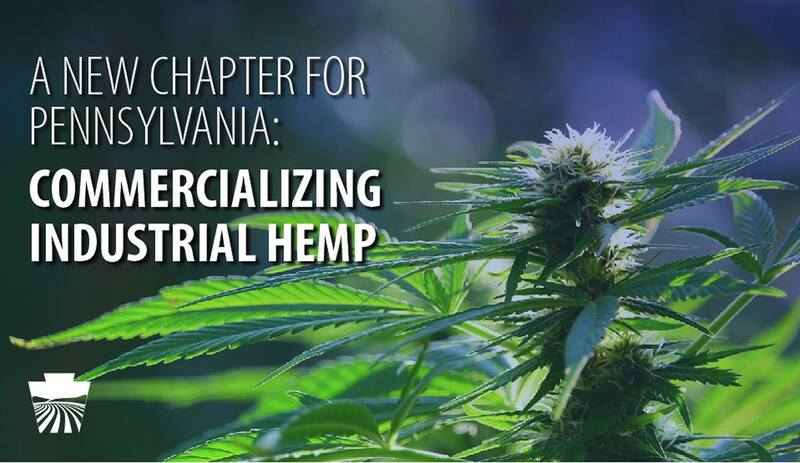 “The passage and signing of the 2018 Farm Bill, particularly the language removing industrial hemp from regulation under the Controlled Substances Act, and providing for commercial production of industrial hemp, are welcome changes that will benefit both Pennsylvania producers and consumers,” said Agriculture Secretary Russell Redding. The state also approved 84 permit applications this week, and the previous cap of 100 acres each participant could have under cultivation has been lifted – there’s now no limit on acreage. Originally, only sixty industrial hemp research projects were to be selected for Pennsylvania’s 2019 growing season, and only those connected to institutions of higher education and growers contracting with Pennsylvania Department of Agriculture (PDA) for research purposes. That’s now all changed with commercial growers to be allowed to participate. This year’s season won’t end with the 84 approved this week. The Department states additional applications will be reviewed and processed on a first come, first serve basis. In another bit of good news, it appears the fee structure for the 2019 Industrial Hemp Program has been revised downward. While the crop was widely grown in the state up until not long after World War II, it’s only recently made a reappearance, with the first season in 2017. This followed Governor Tom Wolf signing an industrial hemp bill into law back in 2016. Pennsylvania is the second state to submit a plan to the USDA, following Kentucky, which lodged its plan the same day the 2018 Farm Bill was signed. Kentucky is going all out this year, with more than a thousand hemp cultivation licenses issued. “The plan that we have submitted to USDA certifies our commitment to creating the conditions for Pennsylvanians to grow a profitable, sustainable, and in-demand product,” said Mr. Redding. Pennsylvania and Kentucky certainly won’t be alone in the pursuit of boosting the crop’s presence in fields throughout the USA. With all this industrial hemp about to appear, perhaps some folks will become more familiar with the plant and stop trying to steal it. More on Pennsylvania’s revamped hemp program can be found here. What Do Jobs In The Cannabis Industry Pay?